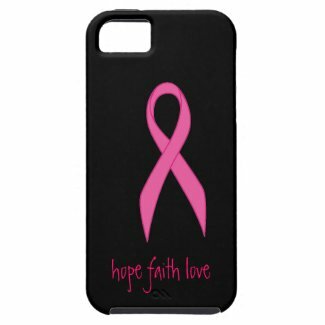 Black iphone 5 case with the breast cancer awareness pink ribbon and the words, 'hope, faith, love' featured in text along the bottom. We have many pink ribbon themed iphone cases and other products (pillows, stickers, magnets and more) to help raise awareness for breast cancer. Great gift ideas or fundraising events.